Craig Kelly, the chairman of the Coalition’s backbench energy committee, clearly doesn’t think much of wind and solar, and it appears he thinks even less of this website. A reader this week sent Kelly a link to a story we published on Monday – or, more to the point, republished from The Conversation – which was co-authored by ANU researchers Andrew Blakers and Matthew Stocks, and which predicted a rapid switch from fossil fuels to renewables. It was titled: Solar PV and wind on track to replace all coal, oil and gas within two decades. So, let’s go into Kelly’s email in detail. It was only a few paragraphs long, but it was Biblical in its bending of the truth. Yes, that’s what the briefing notes from the fossil fuel lobby and the likes of Bjorn Lomborg will tell you. But we’ve dealt with that here, and here, and here, and here. This effort to diminish the role of variable renewables like wind and solar includes their role in “primary energy”, which includes heat and transport, in which wind and solar obviously play a negligible role for now. But what counts is the future (see graph to the right). And there is more of that below relating to Kelly’s predictions. Actually, the IEA suggests that with an aggressive uptake of renewables, one that seeks to address the science of climate change that Kelly denies, renewables will account for 60 (sixty) per cent of total electricity generation by 2040 (half of that from wind and solar), compared to 6 (six) per cent by coal – and even that level of coal will come only thanks to a technology that currently has no economic prospects, carbon capture and storage. This next graph above shows the share of wind and solar in power generation – more than 40 per cent in places like US, and India and in the high 30s across the world and in China, the EU and the Middle East. Remember, this is the IEA, the ultra conservative body that has consistently underestimated the uptake of wind and solar – sometimes by a factor of 10. And they reckon wind and solar will be by far the biggest contributors to global electricity generation – at a time when more heat and transport is electrified – by 2040. The IEA report also makes it clear that with an aggressive update of renewables, the world will NOT be using more fossil fuels than today, as this graph above shows. Indeed, coal gets overtaken in total primary energy demand (including heat and transport) by “other renewables”, essentially wind and solar. And this is what happens to coal – a fall of 80 per cent from business as usual in power generation by 2040 – if efforts are made to act on climate change. A nice allegory to the situation in Australia, and why coal-defenders like Kelly are hell-bent on stopping any such policies. And this is yet another graph to illustrate how the IEA sees wind and solar getting to more than 33 per cent of total electricity generation by 2040. This from a man who once said that renewables would cause children to drown. As mentioned above, this was a reprint from The Conversation and an article written by two highly respected university researchers. But no matter, we would have been happy to print it on its own merits, as we have with Sanford University’s Tony Seba’s predictions of the death of fossil fuels by 2030. Aw, shucks. We just note that fossil fuel subsidies, as noted by both the IMF and the IEA, far outstrip subsidies for renewable energy. Actually, no. We’ve pointed out that many of the newly announced renewable energy projects in Australia carry no subsidy – the bundled price of energy prices and RECs is actually lower than the current wholesale price. RenewEconomy simply argues that the government should be respecting the science, and the global treaty it is signed up to, and have concern for environmental impacts. As for renewables, they just need a level playing field. The market is designed for fossil fuels, it needs to change. Well, actually we do, and we’ve said so since we launched six years ago, when even then it was clear that a renewables future was cheaper, cleaner and safer than a fossil fuels and that customers were being screwed by the fossil fuel oligopoly that was fighting not just a carbon price, but renewable schemes, energy efficiency initiatives, demand management programs, battery storage and any other technology or smart scheme that might crimp their profits and save consumers money. And the fossil fuel majors have had a powerful voice of support in the likes of Kelly and his mates in the Monash Forum. RenewEconomy has railed against the new conservative government in South Australia and its apparent decision to knock on the head a privately funded program to deliver solar and storage to low income houses – and so slash their energy bills – and replace it with their own scheme to provide direct grants and subsidies to those rich enough to have already installed solar. We were outraged by the efforts of the network owners to lift fixed charges, an often cynical ruse that penalises solar households but more insidiously low energy consumers like pensioners, effectively charging them north of 72c/kWh. That’s $720/MWh for mostly coal power. How ridiculous is that? And where was Kelly shouting down the fossil fuel rent seekers when that occurred? If Kelly did give a damn about the disadvantaged consumers in his electorate and elsewhere then he would be pushing for scheme to ensure they too got access to solar and storage, instead of peddling this nonsense. Kelly’s position is a disgrace, and so are those who defend, tolerate and even promote his views. 2GB. Murdoch press. Sky News. Prime minister Malcolm Turnbull. Or get a snide comment from Malcolm “Keep the Coal Burning” Turnbull. And wait for the Minister for Adani to come out and say he hates you as much as he just loves coal and his tax haven-based, rent seeking, royalty and corporate tax avoiding multinational future employer!! Great work Giles, even RWFW are noticing your efforts to educate Australians on the technology driven future opportunities for our economy, a view that clearly is not visible from the fossil fool offices of the MCA nor IPA. Ah yes, the Matteo, ‘The Rescuers Minister’ Coalavan. He has been strangely quiet of late, less than positive news about Adani overseas I’m afraid. Totally, getting noticed by mouth breathers in the coal protection racquet is a badge of honour. Sorry, what does “RWFW” mean? It’s a new one on me too, Jean, but at a guess I’d say Right Wing FuckWits. Which is a pretty good description of most of our Gov’t politicians. Looking at the grammar in the email, it looks like a $4 an hour intern wrote it. It would explain a lot if that is the level of education those in the Coal ash forum have. One thing about the readers of Renew Economy, quick to spot ‘problems’ with text. Giles gets a bit of going over from time to time with his regular supply of ‘typos’. So, Rod, you are right not to spare the Kelly with his lot…more schooling required for the Kelly on his grammar and maybe add a few classes, while he is at school, on ‘Climate and Energy’ to bring him up to speed. Minister’s office comms is not really comparable to high turnover, low margin RE news portal though. Add their IQs together and I doubt you would get to 80. On a good day. Got to love the statements including “a shred of credibility” and “shameless propaganda” – sure he wasn’t doing a spot of self reflection? I think we have entered #PEAKSTUPIDITY They are well funded so expect the “Shameless Propaganda” to only ramp up, supported by statements without “a shred of credibility” to continue on for at least the next 20-30 years! 1. Its fantastic that Craig Kelly is giving RE a plug. Long overdue. Anyone in the media business from Donald Trump to a climate change denier understands that all publicity is good publicity and any mention of a website, such as RE is a validation of that website. So well done Giles you are scoring in the mainstream. 2. Research published this week or last by the United Nations and Bloomberg which I recreated for my presentation to the Smartenergy conference shows that in 2017 19% of power and 12% of energy globally came from renewables excluding large scale hydro. Ie essentially wind and PV. Yes. A badge of honour to be criticised by this coal puppet. It shows RE has made it. Look, no surprise that the Kelly is desperately flaying around. He has to stay in the good books of Big FF so that he can move into new digs, with the likes of Martin Ferguson, after The COALition lose the next election. he’s as bad as MacFarlane – and surprise surprise guess where he works now. I once attended a REGA conference in melb where macfarlane and howard said flat out that they weren’t interested in renewables as we had enough coal to get by. this was despite the fact that there was approx $6bn worth of renewable companies in the conference and despite the fact that govt had been advised straight after 9/11 that the west needed to shift towards distributed energy due to national security concerns. CFPS couldn’t support that security need/ Everyone else has worked out that distributed capability is important – but 16 years later clowns like kelly, frydenberg and turnbull still haven’t understood or read those national security reports. energy management includes the issues around national reserves, something that this govt has wilfully ignored with the closure of the refineries prev distributed across the states. the problem with ministers and apparently some backbenchers is that they think that once they become elected into parlt they also inherit superior subject matter intelligence. and the ex lawyers on all sides are the worst offenders in the smugness and “I am the smartest person in the room” stakes. Well done to you young Hettie…..a test that I planted ….and very nicely spotted!!!!! A lesser man would have blamed autocorrect. Maybe the dude doesn’t have a staffer. Can’t imagine who would want to work with / for him. Everyone in Australia ( at least on here) seems to reckon on Turnbull and his party getting a good kicking at the next GE,love to think so myself, but what happened in SA? All true, but Labor had been in power in SA for 16 years, and before Jay Weatherill some poor stuff had happened, I think. The time for a change mood was strong, and power prices, though coming down at wholesale level, were not yet seen to do so by householders. The feds almost lost last time, unheard of for a first term Gov’t. Well, Gillard 2010, Newman 2014. Too many people are hurting, and this Gov’t is quite shameless in the way it is kicking the have-nots. It doesn’t seem to understand how many of us there are, or that not all of us are stupid. It is quite obvious that extreme weather events and raging bushfire are not caused by the tooth fairy, so the refusal to come up with an energy policy that addresses climate change must be widely resented. The Coalition exists within its own Delcon echo chamber. They must go. In all fairness the email is talking about world’s energy not electricity generation and it said nothing about hydro so I am not sure if you are comparing apples and apples here. I hope Giles emails this riposte to Kelly. Not certain that is a great idea. I read it a few times and still can’t get the data in the article out of the graphs etc. I am certain I am reading it all incorrectly but the text seemed more optimistic than the graphs. Maybe it makes sense to all the seasoned pros but it lost a newbie like me. Too much data, not enough information…? Terrible idea. So many facts could make him combustible. Yes, PLDD, the graphs are somewhat confusing. Perhaps a more “hand holding” is required for me to extract the facts from them that Giles has. the country is at risk from these luddites trying to hold us all hostage to their views, hell, they’ve even abandoning the parties free market mantra and have adopted socialism via federal owned assets (despite the states only having the power under the constitution to do this (unless its an issue of war which then makes it an NSC issue rather than some lunatic backbenchers trying to impose their will on the cabinet etc…. It’s not so much their views as their capture by moneyed interests in FF sector. FF lobbyists walk the corridors of APH with impunity, imagine if you had SS walking through Westminster during WWII. That’s the scale of destruction and human suffering these people will be responsible for if we stay on track for 3-8 ºC of warming, but somehow their asset class makes them immune to critical analysis by our MPs on both sides of the aisle. These people are directly responsible for the deaths of hundreds of thousands of people due to pollution. Yes, Nigel, great idea. I want one! 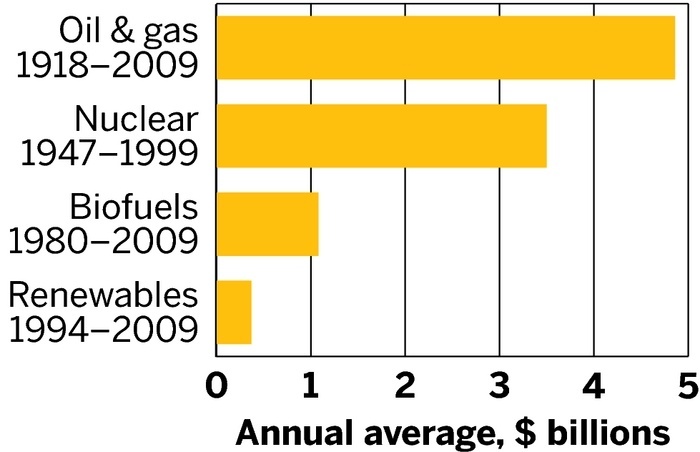 See graphic for subsidies paid by US Governments to the various energy sectors to 2009. This does not include the implicit subsidies of environmental damage, most notably for FF in destroying a habitable planet from catastrophic climate change (still working on my calculation for that) as we waltz past a lock in of 1.5 ºC and 2.0 ºC looks increasingly like a “greenie rent seekers” pipe dream, and of nuclear to country and those places it has catastrophic accidents/design failures. Fossil fuels still a leading receiver of government “rents”, including the pathetic exploitation royalties they pay and inadequate oil spill penalties and compensation payments when that ever gets signed off in court. Sorry to be a bit dim, but what form do these subsidies take, apart from the tax relief on diesel? Just want know of a site that will explain how these subsidies work? It’s easy enough to explain to people the ‘externalities subsidies’ but the others? Sooooooooooooo how do we get him prosecuted for misleading the electorate, again? Naah, far too long for his attention span! And faaar too complex! I’ve been repeatedly re-reading the Blakers/Lu/Stocks paper today. It is a superb (that’s a word I don’t use lightly) piece of work, The Conversation article just touches on the surface of its importance. Truly, an excellent and balanced position on RE, not just in Australia but in any country that enjoys a balance of Wind and PV. This brings to mind some really distressing thoughts. The electricity and transport industries are the low hanging fruit in the climate crisis. The truth is that fixing them 100% in a much shorter time frame than many hope for is most likely. Unfortunately the climate crisis is much much bigger that this part of it. It will be done because the economics line up and its a bread winner. This fact is much more obvious than many other issues that will require decisive, clever and honest political leaders. If you look at all the issues that need to be addressed to save us from extinction, there are about 80 essential changes that need to be made. Does anyone here know what the worst thing is in our contribution to the problem. Have think about it and make a suggestion here. Shoot the bastards who worry about retirement dividends and share options before the health and welfare of people and the planet? There is also the thought that as they are criminally insane they could all be incarcerated for the term of the natural lives in Goulburne Jail. Commuting everyday from suburban home to air conditioned office using FF all the way. CK is a FF Ponce no doubt, but everyone who drives a FF car is just as culpable. Are you talking just of Aus, or the whole world? I was having a whinge yesterday about a democracy in which a certain demographic votes blindly for their default party regardless of how vacuous it has become. I’m loving democracy again today because it means that blockheads like Craig Kelly are sitting on the government side of the house for only about 6 out of every 12 years. Still, 6. out of 12 is still long enough to do considerable damage, esp as many of the vicious bastards, when they realise their time is up, spend the last year or so causing so much damage that the incoming administration has to spend the first year or so cleaning up the mess. There’s plenty of evidence here that it did! And we pay this uneducated moron? Yep, gives you the warm fuzzies doesn’t it. Kelly is clearly barking mad. It’s time the International Criminal Court defined promotion of fossil fuels and/or obstruction of renewable energy as Crimes Against Humanity. Because they definitely are. “……barking mad”…. or mentally ill which would be the defence that he and his ilk would probably resort to as a defence when prosecution time surely comes around. Malcolm Turnbull and Josh Frydenberg insist that they are “technology neutral”. Why then do they tolerate Craig Kelly holding the influential position of chair of the coalition backbench environment and energy committee? There are a range of views in the coalition on coal and renewable energy. Why is an proponent of an extreme point of view considered appropriate as chairperson of this critically important backbench committee? Kelly is entitled to be on the committee, but it makes no sense for him to be chairperson. Kelly is entitled to fully represent his constituency in every manner available. Until Murdoch says no. Rupert Murdoch is a malign influence in every country where he operates. You will find no one to disagree with that on this site. Keeps him out of the way. Makes him feel important. Meanwhile he can’t do any actual damage as the rest of the world are doing their own thing with renewables anyway. Must be very rewarding to be totally irrelevant. “technology neutral” is newspeak for technology neutralising (neutering): if it’s new and technical, it’s scary. Burn it with fire! Could anyone kindly explain what “green rent seekers” actually are? That be the black and brown coal lobby after the green paint brush has re coloured them. Which is ridiculous given that investment in RE is accelerating while subsidies are rapidly drying up. But it’s a lovely story to whip up rage in the Murdoch reading population. Craig is obviously getting hot under the collar and needs to resort to this sort of attacking rant as maybe EVEN he slowly comes to realise the futiliity of his efforts to fight reality for his political FF sponsors. This desperation and quaint (and hypercritical) name calling coming from this last stand of the horse and buggy era idealogues can only be seen as a good thing! Well done RenewEconomy for publishing the unbiased facts. Well done Craig Kelly for showing how desperate your absurd cause is. I think you mean “hypocritical”, i.e. deficient in critical thinking. Someone should explain to Craig Kelly that the IEA has several different future energy scenarios, see https://www.iea.org/publications/scenariosandprojections/. These scenarios are not predictions, they are “what if” exercises: i.e. if we make certain assumptions, what are the likely outcomes? The Current Policies Scenario is a roadmap to disaster. The New Policies Scenario is not much better, but it’s just the IEA’s baseline scenario. Compare this with IEA’s 2 Degree C Scenario (known as 2DS), which limits the total remaining cumulative energy-related CO2 emissions between 2015 and 2100 to 1000 Gt CO2. For the IEA, it’s a belated step in the right direction. Signed – very busy backbench chair. “fossil fuel subsidies and diesel fuel exemptions” that Uriah Heep Frydenburg never dared mention in his Press Club address! LOL. Keep up the great work! It’s like he just learned the term “rent seeker” and is trying to use it in a sentence. Yaaaasssss – some common sense prevailing against the (sponsored) intelligence severely limited by the self-serving interests of the anti-future politicians. Many thanks to Craig Kelly for his insights. It is very helpful to argue the case for renewable energy when views are expressed based on misinformation. The Conversation also has articles which challenge misinformation. accordiing to abbott, the iron triangle in south australia and specifically whyalla should be a basket case due to renewables, someone should tell Mr Gupta that a failed pollie with no commercial background thinks that a successful billionaire has backed a dud….. When you boil it down, the fact that these MPS are so ignorant of science and the concept of scientific evidence, is an indictment of our education sysyem. No child should grow up in such ignorance. May I draw the attention to some elephant in the room so far not mentioned here? “Primary energy” is quite the best thing to marginalise the share of Renewables, as it compares apples to pears, to put it mildly. process, with a yield of 25% (coal, low end) to 60% (gas, high end) final energy in the case of electricity generation. * possible heat cogeneration has been ignored for this example. ** PV, wind, geothermal etc. Can’t remember Kelly ever laughing at you. All that is left now is to win, and sure that will happen in the forecast two decades! The best thing for Kelly to do is go back to school and learn some English. Some arithmetic wouldn’t go amiss either. Excellent response, your next best move to this reality denier attack is to advertise and increase your readership. And now that email has been mentioned in a comment on a Guardian article by Katharine Murphy deploring the Gov’t and its chaos. The source quoted for the Kelly email was this article!! I seized the chance to give R.E. a plug. And replyed to another comment that deplored the brown coal to H2 plan but with no details, and gAve the cost comparison with the wind to H2 project, also the unspecifiable cost of CCS, and all the other mucky waste products of brown coal. Kelly is right to say renewables provide only a small fraction of total energy consumed. This not something to brag about, it’s a disgrace, considering the very high risk global warming poses. Humanity has the technology and the means to change the projected outcome and he and his government are trying their best to aggravate the situation, shame on them. The efficiency of liquid fuel powered vehicles is only 15 to 25%meaning vehicles are using 4 or 5 times more energy than they should. Coal powered electricity is not much better. So much energy waste. Who do these people think they are obstructing the change to renewables, our only hope for a sustainable future? All that you say is true, but there is a big difference between Kelly’s claimed 0.8% and the IEA’s claimed 19% of electricity, and 12% of total energy. Kelly’s claim must not be allowed to stand. Part of his foolishness is to ignore the amount of hydro already part of the RE mix, and its superb ability to support and be complementary to other forms. You only need to glance at the OpenNEM widget to realise how quickly this duet is growing and how soon it will dominate. Like Pauline Hanson, he is so dumb he has no idea that he’s not brilliant.